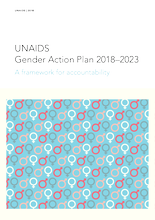 UNAIDS - "Gender equality in the workplace is a human right and critical to the performance and effectiveness of UNAIDS. Organizations with more equal representation of women at the senior management level considerably outperform their counterparts with a lower representation of women in senior positions. Gender-balanced teams have greater potential for creativity and innovation and contribute to better outcomes in decisionmaking.